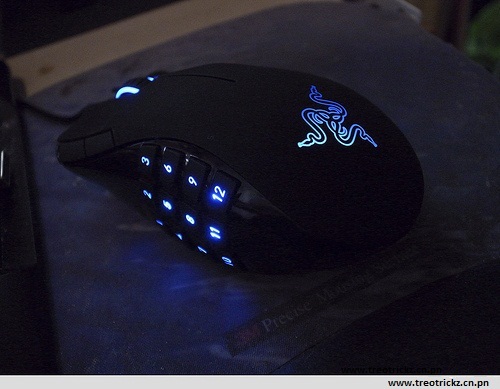 The Razer naga is build specifically keeping MMORPG gamers in mind.It looks a lot like Razer's Mamba mouse,and it features the same blue glow as the Abyssus.The two main buttons are quite wide and offer great grip.Users with various grip styles will adjust to the Naga in no time,but a small worry is that the MMO buttons on the left side are a bit weak,requiring very little pressure to activate. While some buttons are little Hard to reach,once you get used them,you will be using macros effortlessly.A DPI switcher is sorley missed,espically since other gaming mice offer it.Another big oversight is that the MMO buttons cannot be deactivated,so you can accidentally press them when you aren't gaming.The device software lets you turn the logo loght on and off and alter the DPI between 100 and 5600DPI.You can also download add-ons for certain MMO games to configure the keypad buttons in-game.As of now,there are add-ons for only World of Warcraft and Warhammer Online. We tested the Naga with WoW,and it performed quite well.You can move and hit using just the right hand,leaving the left free for chips and soda! It's a great mouse for those who play MMO's but if you play all kind of games,this one isn't for you.The lack of a DPI switcher and the inability to shut off the keypad is a bit downer. At Rs 4,999,it's also a bit of a stretch in the price department.